The fifth annual “Eye on Biodiesel” awards were presented today at the conference general session. Two Florida-based industries were presented with top honors. Florida Power and Light received the “Initiative” award for using B20 in their entire diesel fleet of almost 2500 vehicles. Director of Fleet Services George Survant, here with Joe Jobe, accepted the award. In addition, NBB presented the Pioneer award to NASA’s John F. Kennedy Space Center for switching to B20 in 2003 in its fleet of 144 diesel-powered vehicles. Bruce Chesson with NASA Transportation was spotlighted for his work and he accepted the award on-stage from NBB Chairman Ed Hegland, NBB CEO Joe Jobe and country music singer Michael Peterson. Other awards presented included the Impact award, which was presented to GROWMARK, Inc., for demonstrating its ongoing commitment to the advancement of the biodiesel industry. The company’s bidiesel sales grew from 10,000 gallons in 2000 to an estimated 22.7 MILLION gallons in 2007. GROWMARK’s marketing manager for alternative fuels Mark Dehner, pictured here with Michael Peterson, accepted the award. The National Oilheat Research Alliance received this year’s Industry Partnership award for its efforts in Bioheat heating oil education. 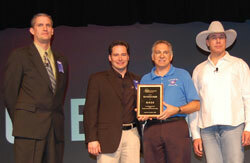 NORA president John Huber accepted the award, pictured here with Ed, Joe and Michael. The Inspiration award this year went to David E. Harris Jr., general manager of transporation services for Harvard University in Cambridge, Mass. Harvard made the switch to B20 five years ago and now fuels 68 vehicles with the blend. Harris meets with potential biodiesel users, represents Harvard at biodiesel evetns and its the leading member and Harvard representative on the EPA’s Greater Boston Breathes Better program. He is pictured here with Joe. Tom Smallwood of the US Marine Corps accepted the “Influence” Award from Michael for use of biodiesel in the Marine Corps. Under Tom’s leadership, use of biodiesel has skyrocketed since 2001. Ninety percent of Marine Corps bases now use biodiesel. Finally, Cummins, Inc. was presented the “Innovation” award for the company’s multi-year research efforts on engine compatibility with biodiesel blends which led them to be one of the first companies to support the use of biodiesel blends in their diesel engines. 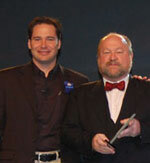 Edward Lyford-Pike accepted the award on behalf of Cummins. Read the NBB press release here.